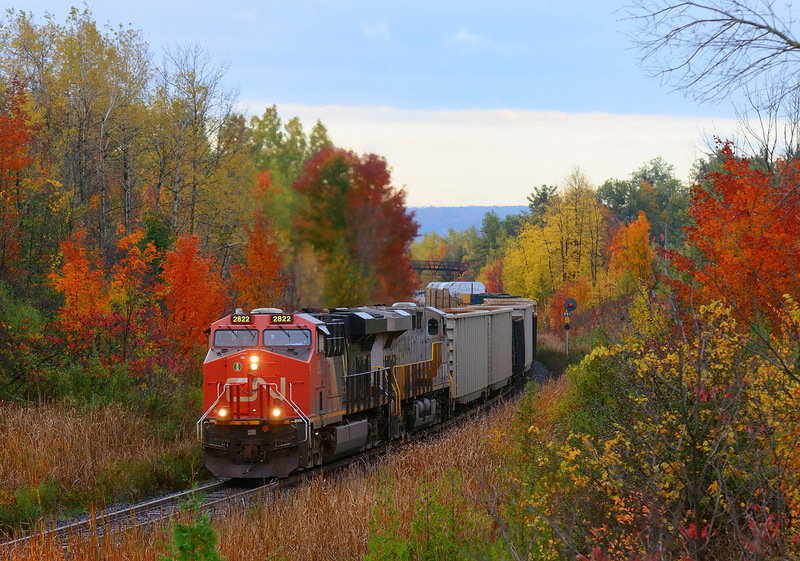 Railpictures.ca - Stephen C. Host Photo: Some locations are just better on overcast days, in the fall, this spot is absolutely a writeoff at all times of the day for an eastbound yet the colours are often really nice. This year wasn’t that half bad, so I shot this eastbound (anyone recall the symbol?) taking advantage of flat light before a pair of westbounds came by and this is my effort. Shot this with rp.ca contributor Michael DaCosta who should have a fairly similar composition. – a telephoto is an absolute must. While I love the brightness you get on a sunny day, a tradeoff is shadows. A tough choice out here, lots of great opportunities though. Westbounds are great in this area in fall/winter , but the sun did not play ball this morning…. | Railpictures.ca – Canadian Railway Photography – photographie ferroviaire Canadienne.